.Try this wonderful Hand and Body Lotion with honey. It will help to protect, and hydrate your dry skin. Goes on silky smooth with non-greasy formula and absorbs quickly into your skin. All of our products are made from scratch using all naturual ingredients. Cactus Flower:This succulent fruit fragrance has notes of crisp apple, grapefruit, bergamot, orange, lemon, peach, mixed berries, vanilla and a hint of musk. Cedarwood Amber:A perfect unisex blend. Warm and sensual amber undertones combine with woodsy notes with just a hint of upper floral tones. 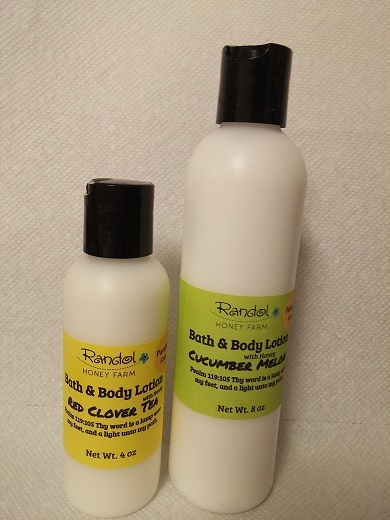 Cucumber Melon:A wonderful blend of fresh, watery cucumber with sweet melon undertones. Grapefruit & Sage:A lovely, near perfect blend of herbal and citrus scents. A subtle scent, perfect if you are looking for something unusual! Lavender: An all-natural blend of Italian, Bulgarian, and French lavender EOs, together with natural lavandin. Love's Delight( Love Spell):Building on a soft base of musk, this scent has middle notes of jasmine, peach, and berries. Top notes include orange, bergamot and mandarin. Based on the Victoria Secret perfume. Milk n Honey: This best-selling scent is warm and inviting, like your grandparents' kitchen on a snowy day. Red Clover Tea: A delicious herbal tea scent, delicately sweet with notes of fruit. Unique and wonderful! Unscented: for those of you who can not have scent, you can still enjoy all the wonderful benefits of this lovely lotion.